Democrats and Republicans are just two different side of the same white supremacist coin. AFRICANGLOBE – A groundswell of Maryland elected officials — including the state’s Black legislative caucus, Gov. Larry Hogan (R) and Prince George’s County Executive Angela D. Alsobrooks (D) — called Wednesday for the resignation of Del. Mary Ann Lisanti, the Har­ford County Democrat who called Prince George’s legislative district the n*gger district. “We know she is one of our colleagues, we know she is a Democrat, but party has nothing to do with the hatred and bigotry that comes out of someone’s mouth,” said Del. Darryl Barnes (D), who chairs the Legislative Black Caucus of Maryland and represents part of Prince George’s County, one of the wealthiest and most highly educated ­majority-African American jurisdictions in the nation. Harford County Executive Barry Glassman, a Republican, also said Lisanti should step down. Lisanti, 51, did not return calls for comment. The incident is the latest race-related embarrassment for Democratic politicians, who were already reeling from revelations in Virginia last month that Gov. Ralph Northam (D) and Attorney General Mark R. Herring (D) decades ago wore blackface. Each state has a long, painful history of racism and a substantial African American population that plays a key role in modern Democratic Party politics. In Maryland, 30 percent of state lawmakers are African American, and the 57-member Legislative Black Caucus wields significant power. Lisanti used the racial slur in late January, in a conversation with Black and white lawmakers at a cigar bar in Annapolis. She told another white lawmaker that when he campaigned in Prince George’s on behalf of a candidate last fall, he was door-knocking in a “n—– district,” said Del. Jay Walker (D-Prince George’s), who witnessed the comment and represents the district in question. None of the lawmakers who witnessed the comment made a formal complaint to House Speaker Michael E. Busch (D-Anne Arundel) or publicly criticized Lisanti. But members of the Legislative Black Caucus heard about what happened and urged that group’s leaders to take action. On Monday night, the caucus executive committee asked Lisanti to meet with them and discuss the incident behind closed doors. The meeting was to take place, bringing the incident into public view. The growing chorus of people calling for Lisanti to resign includes U.S. Sen. Chris Van Hollen (D-Md. ), U.S. Rep. Anthony G. Brown (D-Md. ), state Democratic Party Chair Maya Rockeymoore Cummings, the Maryland American Civil Liberties Union and NAACP conference, the Council on American-Islamic Relations, and the Maryland Republican Party. Alsobrooks said she hoped the uproar over Lisanti’s remark would spark a bigger conversation about inequity, citing a recent report showing that mostly white school districts in the United States received $23 billion more in state and local funding in 2016 than predominantly nonwhite school districts, despite serving roughly the same number of children. She blamed racism for what she described as the underfunding of education in Prince George’s County and other minority jurisdictions. Lisanti, a second-term lawmaker, is one of just a few elected Democrats in heavily Republican Harford County, where voters overwhelmingly chose Hogan for a second term in November over Democratic challenger Ben Jealous. Voters also backed losing Republican candidates for attorney general and U.S. Senate. The county has a population of about 250,000 and is about 76 percent non-Hispanic white and 14 percent Black, according to U.S. Census Bureau estimates. Prince George’s, the second-most-populous jurisdiction in the state, with about 912,000 people, is about 65 percent Black and 13 percent non-Hispanic white. Rockeymoore Cummings, the state Democratic Party chair, said African Americans are about a third of the voters in Lisanti’s district. Many of those residents live in Edgewood, said Denise Perry, the chairwoman of the Harford County Democratic Central Committee and an Edgewood resident. 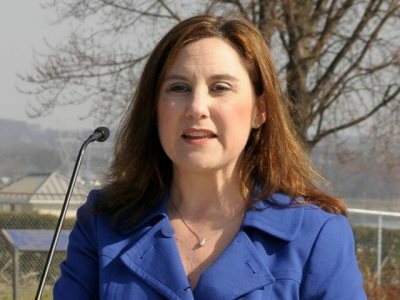 She described Black voters as “instrumental” to Lisanti’s victories in 2014 and 2018. “Edgewood has been ignored in terms of resources, and then to hear that’s how she feels about African Americans, her actions have shown it. . . It’s totally unacceptable,” said Perry, who also said Lisanti should step down. Busch stripped her of her leadership posts, and she agreed to undergo sensitivity training. If Lisanti resigned, the Harford Democratic Central Committee would recommend a replacement to Hogan, who is charged with appointing someone to fill the seat.